Your idea as a 3D model? No problem! We will create your 3D object according to your wishes and specifications in the maximum size of 400x400mm. This can be a prototype, or a spare for your vehicle. Even if you want to have a non-automotive 3D model, you can also send it to us. We print in the FDM process, where the so-called filament, a plastic filament made of PLA (Polylactic Acid) bioplastics is melted and layered. Please click on the picture for a bigger view. For the 3D printing on our in-house printer, the Pharao XD 40, we need a file in STL or OBJ format. For this purpose, a consultation would be necessary to define the quality of the model. Also a file in the Gcode format would be possible, then you would already set the print speed and quality itself. 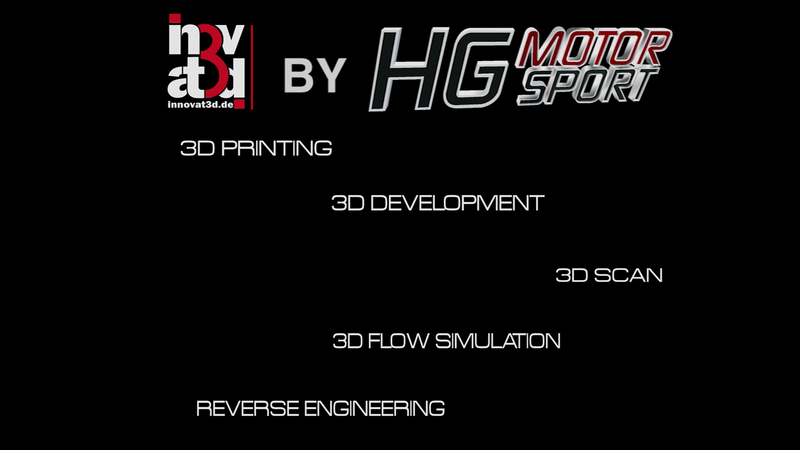 We recommend the following for customers who are already experienced in 3D printing. In order to create 3D objects yourself you have to master a 3D software. You can also provide us with files. In addition, we offer you to create a suitable file by our 3D draftsman. The hourly rate of our employee is added to the print. For this, you need an individual consultation on how the model is developed according to your wishes. The price depends on the individual requirements you have on your product and how you want to use one of our additional offers (scanning, printing, drawing, flow animation). We look forward to your request for a non-binding consultation call at 0451/4094600 or an e-mail to anfrage@hg-motorsport.de. This Product was added to our catalogue on Monday, 18. September 2017.